Russet Street Reno: Freak out and do CRAFTS! Less than three days until the wedding. I'm in serious freakout mode...the weather is mocking me with a nice sunny 60 degree day on Friday and a cold rainy suckfest for our wedding day. This is unacceptable for our outdoor ceremony. I've been informed that the backup plan is having the ceremony in the venue's 'River Club' which has carpet, red walls, and a yellow ceiling. I can hear your collective gasps as you read that. It's like my worst nightmare. I've been keeping my mind off it with all the other little things that I've made for the wedding, like these table numbers that have funny housewife postcards from Anne Taintor on the other side...this is my favorite project! I also used some old calendars to make cute framed 'messages' for various areas around the reception. This one is for the bar, clearly! We're using mini gumball machines as place cards, aqua for guests, red for the bride and groom's table. I also bought some plain votive holders from Michaels and added ribbon to them using my awesome Xyron tool! Side note - if you are looking for good votives, Michael's value pack of 24 votives are awesome quality. They burn for over 9 hours! All of my red ribbon holders are ready to go, also. I am wondering what the heck I will do with all these when the day is over? I may ask people to take them home, because I don't want to sell my hard work! I also made a pretty cute card box - I will share a how-to later on. Oh, and four of us wore tutus and crazy tights. Yes, we are all over 30. Ok, Katie (yellow tutu) isn't...but she's pregnant, so that's close enough! We went out to dinner and then to the most rad nightclub in Milwaukee, Victors! They know how to treat their VIP ladies. I didn't drink all of it myself. I think I tried, though! When we got back, the three remaining chicks decided to play with the camera and tripod for a little while, and we captured so many hilarious and huggy-kissy photos - I love that I set it up before we left. And the finale - I have no words for this shot! Too funny. I will hopefully get a couple pics of the wedding up on Sunday, before we leave for Jamaica...I'm setting up my camera/tripod at the reception with a professional backdrop and umbrella lights - so we will have our own little 'photobooth' going on. I can't wait to see the pictures! Have a great weekend and please send me good 'sunny' vibes! Gumball machines, votive candles, tutus and good girlfriends.... :-) Have a happy wedding day!!!!!!!! Your wedding sounds amazing! I hope everything works out weather wise but regardless it's your special day no matter what mother nature decides and so it is going to be fabulous! Congrats!! My wedding gift to you is a break in the weather and a pure shot of South Florida sun! I love all of your decorations, the placecards are hysterical, and I'm sure it will be a blast no matter what. Welp, I've heard that rain on your wedding day is good luck! Or, you'll be rich! Or something... Either way, good for you not stressing. You can't do anything about it, so don't let it get you down. Your family and friends being there for your marriage is what really matters--yay! (Yellow ceiling or not!) Hopefully you'll luck out anyway. I love your table numbers--cute!! Have a wonderful wedding and honeymoon :) We loved our trip to Jamaica. You seriously have the greatest ideas. Your wedding is going to be beautiful and memorable and perfect, whether it's in the great outdoors or the great...yellow....indoor site. Seriously. It's going to be amazing. But all fingers and toes are hereby crossed for a better forecast. Can't wait to see pictures!!! Everything looks great - and so you!! Have an awesome wedding day and a great time on your honeymoon. And then let's get together when your life returns to "normal" lol! It's going to be so pretty! Congratulations and enjoy every minute of it! I love all your cute crafts!! Everything turned out so beautifully! Looks like you guys had a wonderful time at your party. =] Yay! I'm sending sunny vibes your way!! I aspire to be you. Your stuff is so freakin cute! And I'm going to ask you a question about your photobooth, but not until you get back from your honeymoon and are no longer freaking out and doing CRAFTS. I'm sending lots of sunny vibes your way! Although if anyone can pull off red walls and a yellow ceiling, it's you. Congrats! How exciting that the big day is here already! :) Everything looks fantastic and I am so looking forward to seeing photos Sara! Sending you lots of sunny, gorgeous weather vibes! 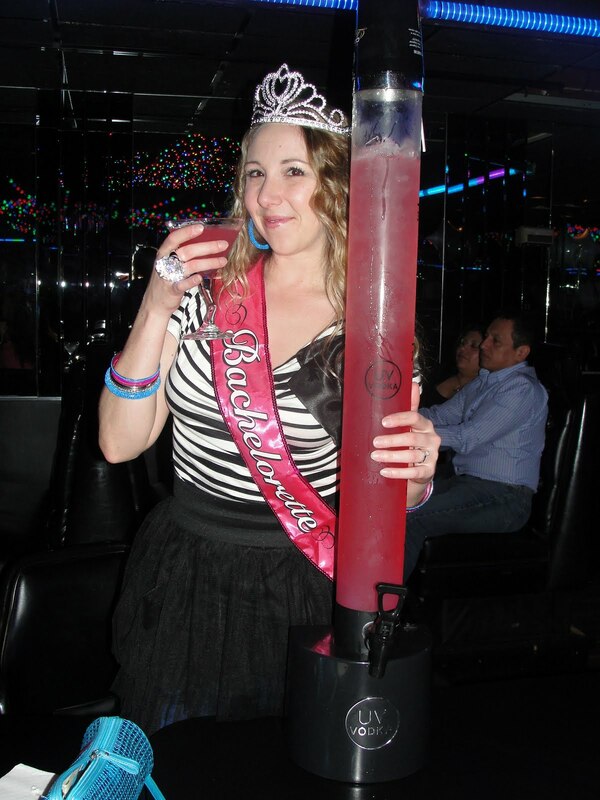 And those bachelorette photos... AWESOME! :) All the best on your big day!!! OK, I think I've got an awesome thing to tell you that my florist told me to keep me from freaking out about weather. Ready? I seriously wanted an outdoor ceremony but was scared of being rained out and my florist told me that even if it rains, it usually doesn't rain during 20 to 30 minutes brides need to exchange vows. She said that of all of her clients for the many years she has done this, she only averages about 1 rain out per year where it HAS to be moved inside...and she said that every time, it's almost like it's meant to be. Like their decor and venues were much better for indoors and they just didn't realize it. She said they always ended up thankful to have it moved indoors. You only need a handful of minutes out of the entire day and weather forecasts are always so wrong (the royal wedding was supposed to be rained out! ), so have no fear m'dear! Phew. Enough of my rambling! Your wedding stuff is cute, cute, cute. And I LOVE!! 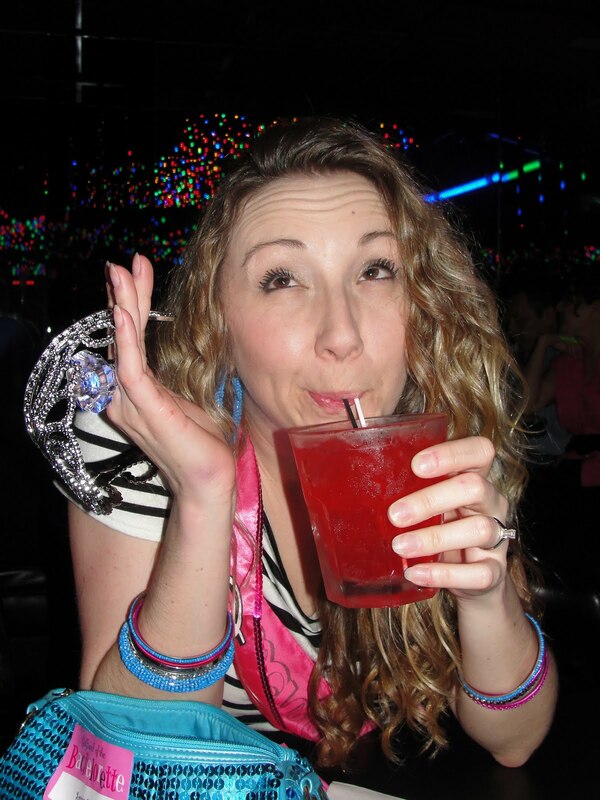 your tutus and lollipops bachelorette party. SO sweet!! Congrats!! I'll be doing a rain dance out her in the dirty south! The decorations look awesome and your bachelorette party looks like it was a hoot! Have fun in Jamaica! I love it all! The crafts are awesome, the pictures are fun - it's all great all around. Try not to stress about the weather. It was supposed to rain on my wedding day too and despite some sprinkles 20 minutes before the ceremony everything was fine. And even if it DOES rain, so what?! As long as you end up married it's a successful event! And rain on your wedding day is supposed to be good luck! I'll still send lots of sunshine vibes your way! Have fun and Congrats!!!! Eeek! I can't believe it's already here! Have a fantastic time! I can't wait to see the photos!!!! I love the gumball machines--what a great idea! Felicitations and best wishes for a pleasant sunny day! Looks like a really fun time. Your friends are too cute - looks like you had a ball! Your wedding sounds like it is going to be incredibly fun. Can't wait to see all the details come together. Enjoy the day (it flies by) and the honeymoon to Jamaica. you're going to have so much fun!!!! congrats! No matter what, enjoy the day and soak it all in! It's one of the only times in your life you'll have all the people you love most in one room! Looks like you had lots of fun with your girlfriends. Sending you sunny vibes all the way from Montreal. Have fun this weekend! Have a FABULOUS wedding weekend and honeymoon!! The stupid weather WILL hold off! It's going to be awesome, congratulations!